The rodent retina has long been recognized as an accessible window to the brain. In this technical paper we provide a protocol that employs the mouse model of oxygen-induced retinopathy to study the mechanisms that lead to failure of vascular regeneration within the central nervous system after ischemic injury. The described system can also be harnessed to explore strategies to promote regrowth of functional blood vessels within the retina and CNS. Miloudi, K., Dejda, A., Binet, F., Lapalme, E., Cerani, A., Sapieha, P. Assessment of Vascular Regeneration in the CNS Using the Mouse Retina. J. Vis. Exp. (88), e51351, doi:10.3791/51351 (2014). The rodent retina is perhaps the most accessible mammalian system in which to investigate neurovascular interplay within the central nervous system (CNS). It is increasingly being recognized that several neurodegenerative diseases such as Alzheimer’s, multiple sclerosis, and amyotrophic lateral sclerosis present elements of vascular compromise. In addition, the most prominent causes of blindness in pediatric and working age populations (retinopathy of prematurity and diabetic retinopathy, respectively) are characterized by vascular degeneration and failure of physiological vascular regrowth. The aim of this technical paper is to provide a detailed protocol to study CNS vascular regeneration in the retina. The method can be employed to elucidate molecular mechanisms that lead to failure of vascular growth after ischemic injury. In addition, potential therapeutic modalities to accelerate and restore healthy vascular plexuses can be explored. Findings obtained using the described approach may provide therapeutic avenues for ischemic retinopathies such as that of diabetes or prematurity and possibly benefit other vascular disorders of the CNS. Throughout CNS development, nerves, immune cells and blood vessels establish remarkably coupled networks to ensure adequate tissue perfusion and allow transmission of sensory information1-5. The breakdown of vascular systems results in insufficient tissue oxygenation and compromised metabolic supply and is increasingly recognized as an important contributor to the pathogenesis of neurodegenerative diseases6. Vascular dropout and the deterioration of the neurovascular unit within the brain, for example, is associated with vascular dementia, vascular lesions of the white matter of the brain7 and Alzheimer’s disease with stenosis of arterioles and small vessels8. In addition, impaired vascular barrier function is thought to contribute multiple sclerosis9 and amyotrophic lateral sclerosis10. Of direct relevance to the retinal model described in this protocol, blinding diseases such as diabetic retinopathy11 and retinopathy of prematurity12,13 are characterized by a phase of early vascular degeneration. The ensuing ischemic stress on the neurovascular retina triggers a second phase of excessive and pathological neovascularization that likely originates as a compensatory response to re-instate oxygen and energy supply14-16. An attractive strategy to overcome the ischemic stress that is central to disease progression is to restore functional vascular networks specifically in the ischemic zones of the neuro-retina (Figures 2 and 3). Provoking a controlled angiogenic response may come across as counter-intuitive for a condition in which anti-angiogenic treatments such as anti-VEGFs are considered as adapted treatments. Yet, evidence for the validity of this approach is mounting. For example, enhancing “physiological-like” vascular regrowth in ischemic retinopathies has been elegantly demonstrated through introduction of endothelial precursor cells17, inhibition of Müller cell-expressed VEGF induced downregulation of other angiogenic factors18, injection of myeloid progenitors19, inhibition of NADPH oxidase induced apoptosis20, increasing dietary ω-3 polyunsaturated fatty acid intake21, treatment with a carboxyl-terminal fragment of tryptophan tRNA synthetase22, and direct administration of VEGF or FGF-2 for protection of glial cells23. Moreover, we have demonstrated that modulating classical neuronal guidance cues such as Semaphorins or Netrins in ischemic retinopathies accelerates vascular regeneration of healthy vessels within the retina and consequently reduces pathological angiogenesis24,25. Of direct clinical relevance, several of the aforementioned animal studies provide evidence that promoting vascular regeneration during the early ischemic phase of retinopathies can significantly reduce sight-threatening pre-retinal neovascularization19,23,24,26, likely through the reduction of ischemic burden. Devising therapeutic strategies that stimulate regeneration of functional vessels remains a significant challenge for vascular biologists. Here we describe an experimental system that employs the mouse model of oxygen-induced retinopathy (OIR) to explore strategies to modulate vascular regrowth within the retina. Developed by Smith et al. in 199427, this model serves as a proxy for human proliferative retinopathies and consists of exposing P7 mouse pups to 75% O2 until P12 and subsequently re-introducing the pups to ambient room O2-tension (Figure 1). This paradigm loosely mimics a scenario where a premature infant is ventilated with O2. The exposure of mouse pups to hyperoxia provokes degeneration of retinal capillaries and microvasculature, and yields a reproducible area of vaso-obliteration (VO) typically assessed upon exit from O2 at P12, although maximal VO area is reached at 48 hr (P9) after exposure to O2 28. In the mouse, the avascular VO zones spontaneously regenerate over the course of the week following re-introduction to room air and eventually VO zones are completely re-vascularized (Figure 2). Re-introduction to room air of mice subjected to OIR also provokes pre-retinal neovascularization (NV) (maximal at P17) that is typically assessed to determine the efficacy of anti-angiogenic treatment paradigms. In its purest form, the OIR model provides a highly reproducible and quantifiable tool to assess oxygen-induced vascular degeneration and determine the extent of destructive pre-retinal neovascularization29-31. Various explorative treatment paradigms that modulate CNS vascular regeneration can be investigated using the OIR model including use of pharmacological compounds, gene therapy, gene deletion and more. The propensity of a given approach to influence vascular regrowth is assessed step-wise in the window between P12 (maximal VO after exit from hyperoxia) and P17 (maximal NV). Evaluation of treatment outcome on pathological NV can be rapidly and easily determined in parallel and has been thoroughly described by Stahl and colleagues30,31. Here we provide a simple step-by-step procedure to investigate the modulation of physiological revascularization within the neural retina by pharmacological compounds, prospective therapeutics, viral vectors or to study the influence of candidate genes in transgenic or knockout mice. Ethics statement: All animal experimentation adheres the animal care guidelines established by the Association for Research in Vision and Ophthalmology (ARVO) Statement for the Use of Animals in Ophthalmic and Vision Research and the Canadian Council of Animal Care. Record date of birth of mouse pups as P0. Record all weights of animals upon entry into O2 to ensure an adequate weight range. Note: For C57BL/6 mice at P17, body weight should range between 5 and 7.5 g for maximal NV32. In order to maintain environmental consistency, it is recommended to use littermates as control (for genetically modified mice as well as mice receiving experimental treatments). When assessing effects of a viral vector, one must consider tropism of the virus and allow sufficient time for full expression of virally-delivered transgenes. Rapidly expressing viral vectors such as 3rd generation lentiviruses24,25,33 are recommended. Place mouse pups at P7 (C57BL/6 or desired strain) and a CD1 fostering mother into an oxygen chamber set at 75% O2 for 5 days27. Environmental humidity and temperature were held constant throughout O2 exposure. Note: Research facilities equipped with a central source of O2 are ideal and limit the cumbersome replacement of empty O2 tanks. If working with transgenic or knockout mice, it is important to ensure that control and experimental mice are acquired from the same vendor to limit genetic drifts within the same strains30,29. At P12, remove mice from the oxygen chamber and return animals to ambient O2. At P14, anesthetize mice with 2% isoflurane in oxygen 2 L/min (or animal protection committee-approved anesthetic of choice). In order to verify the effectiveness of the anesthesia, sequentially pinch the tail, rear foot and ear with forceps. Place the mouse on its belly. Using a sterile 10 µl syringe fitted with a beveled pulled-glass needle, perform an injection of a maximal volume of 1 µl of solution containing the compound being investigated or vehicle (physiological saline) at the posterior limbus of the eye, with a 45° angle avoiding the lens. Note: The pulled glass-needle is attached to the syringe using a drop of epoxy-resin. Apply a drop of lubricant ophthalmic ointment (ideally with antibiotic) with a swab to the mouse’s eye. Return the mouse back to the cage with fostering mother. Mice are then carefully monitored until recovered and fully ambulatory. Anesthetize mice with 2% isoflurane in oxygen 2 L/min (or animal protection committee-approved anesthetic of choice). In order to verify the effectiveness of the anesthesia, sequentially pinch the tail, rear foot and ear with forceps. Note: This is typically performed at P17 when regeneration is assessed. Also carry-out the analysis at P19 and P21 to determine if vascular integrity is preserved over time. Once anesthetized, weigh the mouse. Make a midline abdomen incision with dissecting scissors. Note: Dissecting instruments should be regularly checked and sharpened. Cut ribs laterally and raise the ribcage with the aid of forceps. Note: It is necessary to cut as laterally as possible to avoid damage to the heart. After removing peripheral tissue from the heart, clamp the descending aorta with hemostatic forceps. Slowly inject fluorescein-dextran to the left ventricle using a 25 G needle. Note: If vascular barrier function is investigated, 70 kDa fluorescein-dextran is employed as it will leak out of vessels when vessel integrity is compromised. If the investigator wants to cast blood vessels, 2 MDa fluorescein-dextran is used. Critical steps: 1) To ensure a homogenous repartition, centrifuge fluorescein-dextran and inject the supernatant, 2) In order to prevent vessel constriction, inject warmed fluorescein-dextran solution, 3) Its circulation time shouldn’t excess 4 min. Decapitate mice 2 min after injection with operating scissors. Note: When assessing rates of vascular regeneration, first collect retinas at P12 and additionally at P14 and P17. Increase the number of sampled time points for more accurate determination of rates of revascularization24. Tilt the mouse head and place it on its side. Remove skin and eyelids covering the eye using dissecting scissors. Place curved forceps below the eye and gently pull it up until the optic nerve is severed. Turn the mouse’s head onto its other side and perform the same steps (steps 4.2 and 4.3). To ensure better penetration of fixative, puncture a hole in the anterior chamber of the eye using 30 G needle. Transfer eyes to a tube containing 4% paraformaldehyde (PFA) and fix for 1 hr at room temperature. Remove PFA and wash eyes 4 times with a solution of ice-cold PBS. Place mouse eyes in a Petri dish containing cold PBS and perform dissection of the retinas under a stereomicroscope. Remove extra fat/tissue surrounding the eye with micro-dissection scissors. Cut off the cornea with micro-dissection scissors. Using two pairs of forceps, minutely peel the sclera away from the periphery towards the optic nerve and discard. Pinch the lens (whitish ball beneath the cornea) with forceps and extract it from the eye cup. Use one pair of forceps as a support, and the other to grip and carefully raise and remove the lens. Detach the hyaloid vessels from the inner side of the retina using small brushes (size 0) and forceps. Remove bundles of hyaloid vessels connected to the optic disc using forceps. Transfer dissected retinas to 2 ml microcentrifuge tubes containing PBS and place on ice prior to starting the staining procedure. Incubate dissected retinas overnight with gentle shaking at 4 °C in a solution of fluorescently coupled-isolectin B4 (rhodamine-lectin or other) in PBS containing 1 mM CaCl2 (a 1:100 dilution of a 2 mg/ml isolectin B4 solution is recommended). During the entire staining procedure, cover tubes with aluminum foil or an opaque foil to protect from light. On the following day, remove staining solution and wash retinas 3x in PBS for 10 min at room temperature. Transfer retinas, photoreceptor-side down, onto a microscope slide and make four deep equidistant radial incisions using a surgical scalpel to divide the retina into four equal-sized quadrants. During the incisions, brace the retina with a brush so that it does not move. Using two brushes soaked in PBS, carefully flatten the quadrants photoreceptor side-down and immerse the retina in mounting medium to prevent photo-bleaching. Then carefully place a coverslip on the surface of the mounted retina without applying pressure and making sure that air bubbles do not accumulate under the cover slip. Take images of whole-mounted retinas with an epi-fluorescence microscope at a magnification of 10X. Open the retinal image in photo editing software, stitch together and measure the total retinal area, and avascular area. Area can be expressed in pixels. Determine extent of VO by dividing the number of pixels in the avascular area by the number of pixels in the total retinal area. Determine extent of NV by dividing the number of pixels of NV by the number of pixels in the total retinal area as described31. The OIR model is widely used to study oxygen-induced vascular degeneration and ischemia-induced pathological neovascularization in the retina and has been instrumental in the development of currently employed anti-angiogenic treatments for ocular diseases27,29,30. Findings obtained using this model can be loosely extrapolated to ischemic retinopathies such as proliferative diabetic retinopathy and retinopathy of prematurity30. 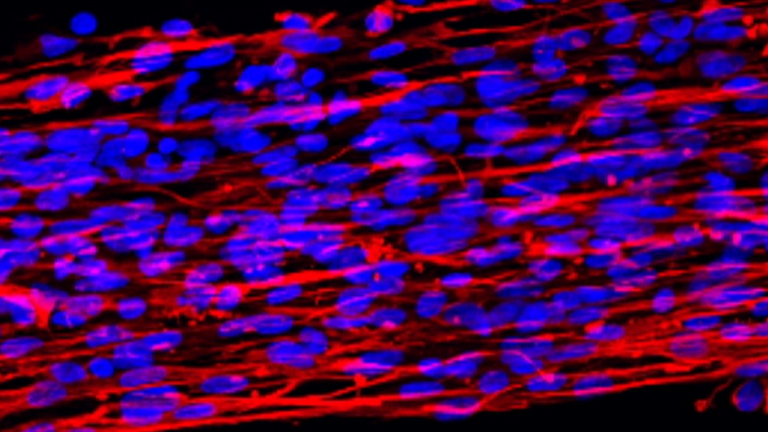 Here we present an alternative use of this model to study vascular regeneration. We will describe an example of a strategy to regenerate the ischemic retina that was recently published by our lab. In the presented study, we demonstrate that sustained neuronal ischemia activates endoplasmic reticulum (ER) stress and via one of its effector endoribonucleases IRE1α, cleaves the mRNA of the classical neuronal guidance cue netrin-1. We show that intra-ocular delivery of the Netrin-1, stimulates a program of reparative angiogenesis in retinal myeloid cells and thus accelerates neural tissue revascularization after OIR25. Moreover, we provide an example of accelerated vascular regeneration using lentiviral mediated silencing of IRE1α. The described experimental paradigms can be modified to investigate the explorative treatment of choice. Importantly, the time point of intravitreal injection is determined based on the nature of the explored compound and must take into consideration the mechanism by which the investigated treatment acts. For example, to study a pharmacological compound (receptor agonist, antagonist, etc. ), P14 may be selected as it corresponds to a time point where retinal revascularization is accelerating yet a rapid-acting intervention may help speed up the rate of revascularization (Figures 2 and 3a). When viral vectors are employed, enough time must be allotted to allow for full expression of the passenger gene and an earlier time point may be selected to ensure full expression of the transgene or full silencing of the target gene (Figure 4). Lentiviral based vectors are particularly well suited in this regard due to their rapid expression, low inflammatory response and ease of production24,25. It is also crucial to make certain that the target gene is delivered to the appropriate retinal cell population (RGC, Endothelial cell, Müller Cell, etc. ), hence the tropism of the selected viral vector must be considered. Alternatively, studying the role of a gene in vascular regeneration using transgenic or knockout animals offers the advantage of not needing to perform intra-ocular injections. Figure 1. Schematic depiction of the mouse OIR model. Mouse pups and nursing mothers are exposed to 75% O2 from P7 to P12. A ventilated oxygen chamber with steady O2 delivery and oximeter is required. During this initial period, retinal vaso-obliteration occurs. At P12, mice are returned to room air (21% O2) until P17 when maximal pathological pre-retinal tufting occurs. Neovascularization recedes over the following days. 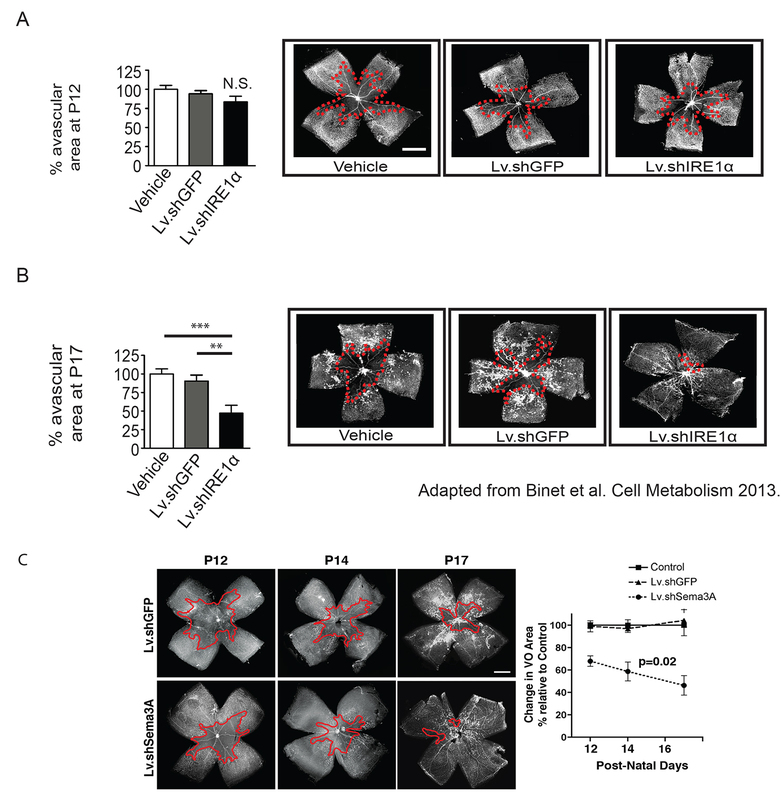 The ideal period to investigate vascular regeneration is the window between P12 and P17. Sampling and assessing several time points for extent of vaso-obliteration is key to elucidating accurate rates of revascularization. Figure 4. Example of gene silencing with lentiviral-delivered shRNAs for retinal vascular regeneration: Lv.shIRE1α. To assess the ability of gene silencing of IRE1α in retinal ganglion neurons to aid vascular regeneration, an intravitreal injection of a lentivirus coding for an shIRE1α was injected at P3 to allow sufficient time for gene silencing when vascular growth and vaso-obliteration is assessed. The 3rd generation lentivirus employed in this example contains a modified vesicular stomatitis virus glycoprotein (VSV-G), engineered to target plasma membranes. Although these vectors effectively infect retinal ganglion cells, expression can also be noted in other local cell types. (A) This treatment did not lead to noticeable variations in oxygen-induced vaso-obliteration as determined at P12, signifying that all observed benefits on vaso-obliteration measured at later time points are due to increased vascular regeneration. (B) Inhibition of IRE1α in this paradigm dramatically enhanced vascular regeneration in the regrowth phase of OIR at P17. (This figure has been modified from Binet et al. Cell Metabolism 201325) (C) Assessing a third time point of vaso-obliteration such as P14, is required to determine accurate rates of revascularization. (This figure has been modified from Joyal et al. Blood 201124) Please click here to view a larger version of this figure. What is the most effective way to stimulate growth of new healthy vessels in ischemic nervous tissue? Is it therapeutically valid to interfere with and accelerate naturally occurring vascular regrowth? In neuro-ischemic pathologies such as ischemic retinopathies or stroke, vascular degeneration is associated with reduced neuronal function35-38. Hence to counter early injury, reinstating regional micro-circulation during the immediate/early segment of disease may prove beneficial. 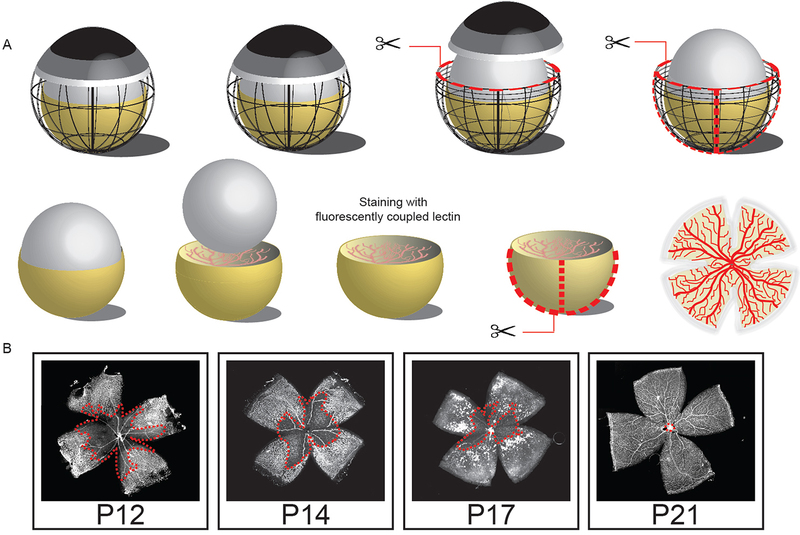 In an ocular context, experimental paradigms that accelerate revascularization of the ischemic retina reduce pathological neovascularization 21-25,34 and thus this approach merits further investigation. Since its introduction 20 years ago, the OIR model27 has revolutionized retinal angiogenesis research30. Here we provide an additional application for this model to study prospective strategies to modulate physiological vascular regeneration in the ischemic retina. An ideal animal model should encompass several criteria such as proximity to human patho-physiology, high reproducibility, rapid execution and ideally, low cost. The mouse model of OIR meets all these criteria and can be carried-out in less than 3 weeks. Despite the numerous listed benefits, drawbacks include the current need to sacrifice the mouse prior to analyses and hence accurate longitudinal monitoring of an animal is not yet possible with current imaging tools. Currently, in vivo imaging techniques such as OCT or fluorescein angiography are largely unsuccessful due to the inherent optical limitation of the mouse eye (curvature radius and small size) which reduces imaging coverage39 to the most central regions of the retina which are not relevant to the early stages of the model. When employed to study vascular regeneration as proposed in this protocol paper, all considerations that apply to studying neovascularization should also be monitored. These include recording animal weight to estimate the metabolic health of the pup, which heavily influences angiogenesis32. Accurate control of oxygen tension in the hyperoxic chamber is also critical. Variation in oxygen concentration has a direct impact on vasoobliteration, which can inevitably lead to critical data misinterpretation. It is therefore recommended to either implement continuous electronic monitoring of chamber oxygen concentration or in the least, monitor daily changes in oxygen levels and limit oxycycler door opening to maintain constant oxygen levels. Optimal processing of retinas also takes practice. Extraction, mounting and staining of the retina must be executed with care as the relatively fragile retina must be delicately handled. In addition, as for all experimentation with genetically modified animals, the genetic drift of a colony can confound results. In absence of a selective force (in a mouse colony for example), the allelic or genetic drift is a random process that can lead to large changes in population over a short period of time. Allele frequencies can change from generation to generation and result in the formation of a sub-colony40,41. These mutations are largely undetectable and it is thus important to limit the number of generations produced by the same breeder pairs in the same colony. The most efficient way to attain the highest genetic stability is to refresh “stocks” every five generations or proceed to backcrossing with a purchased mouse of identical background. It is also recommended to test for retinal degeneration mutations (rd) 1 and 8 42, at least once before starting a new line in order to avoid confounding phenotypes that can be attributed to premature photoreceptor degeneration. For transgenic animals, it is vital to ensure that both control and mutant mice are obtained from the same vendor and are necessarily on the same genetic background. As we continue to elucidate the molecular mechanisms of blood vessel formation and growth, novel approaches to accelerate, slow, or steer nascent blood vessels are arising. A model system in which modulation of vascularization can be explored in vivo in a pathological context may provide a valuable tool to explore prospective therapeutic paradigms to counter neuronal ischemia within the CNS. Adapting the mouse OIR model to study vascular regeneration provides such a venue and will continue to be a valuable tool to further our understanding of the molecular basis for physiological and pathological angiogenesis. PS holds a Canada Research Chair in Retinal Cell Biology and the Alcon Research Institute New Investigator Award. This work was supported by grants from the Canadian Institutes of Health Research (221478), the Canadian Diabetes Association (OG-3-11-3329-PS), the Natural Sciences and Engineering Research Council of Canada (418637) and The Foundation Fighting Blindness Canada. Support was also provided by the Reseau de Recherche en Santé de la Vision du Québec. Carmeliet, P., Tessier-Lavigne, M. Common mechanisms of nerve and blood vessel wiring. Nature. 436, 193-200 (2005). 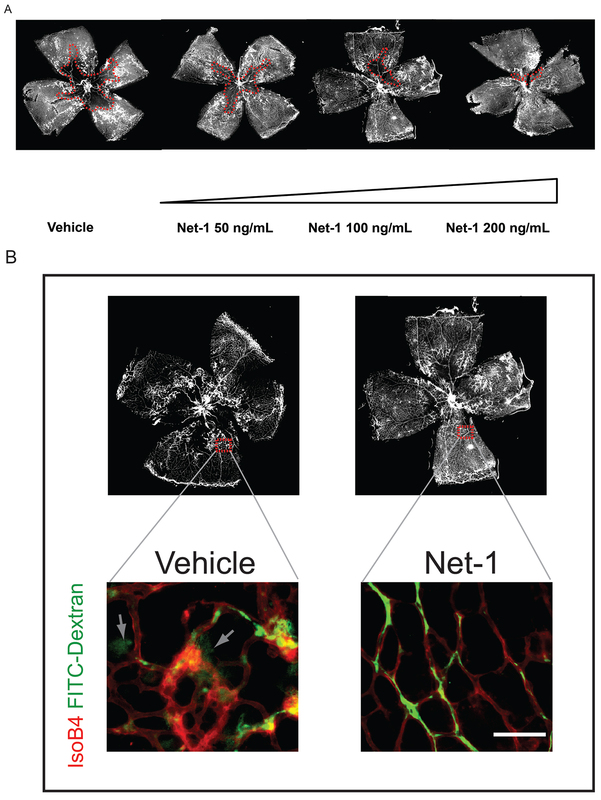 Eichmann, A., Thomas, J. L. Molecular Parallels between Neural and Vascular Development. Cold Spring Harb Perspect Med. 3, (2012). Larrivee, B., Freitas, C., Suchting, S., Brunet, I., Eichmann, A. Guidance of vascular development: lessons from the nervous system. Circ Res. 104, 428-441 (2009). Stefater Iii, J. A., et al. 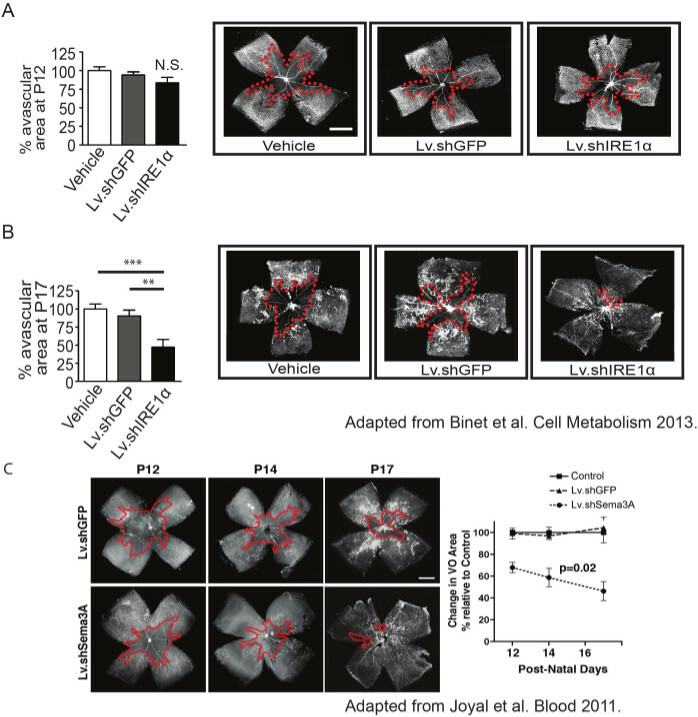 Regulation of angiogenesis by a non-canonical Wnt-Flt1 pathway in myeloid cells. Nature. 474, 511-515 (2011). Checchin, D., Sennlaub, F., Levavasseur, E., Leduc, M., Chemtob, S. Potential role of microglia in retinal blood vessel formation. Invest Ophthalmol Vis Sci. 47, 3595-3602 (2006). Quaegebeur, A., Lange, C., Carmeliet, P. The neurovascular link in health and disease: molecular mechanisms and therapeutic implications. Neuron. 71, 406-424 (2011). Yamamoto, Y., Craggs, L., Baumann, M., Kalimo, H., Kalaria, R. N. Review: molecular genetics and pathology of hereditary small vessel diseases of the brain. Neuropathol Appl Neurobiol. 37, 94-113 (2011). Brun, A., Englund, E. A white matter disorder in dementia of the Alzheimer type: a pathoanatomical study. Ann Neurol. 19, 253-262 (1986). Prat, A., et al. Migration of multiple sclerosis lymphocytes through brain endothelium. Arch Neurol. 59, 391-397 (2002). Rule, R. R., Schuff, N., Miller, R. G., Weiner, M. W. Gray matter perfusion correlates with disease severity in ALS. Neurology. 74, 821-827 (2010). Antonetti, D. A., Klein, R., Gardner, T. W. Diabetic retinopathy. N Engl J Med. 366, 1227-1239 (2012). Hartnett, M. E., Penn, J. S. Mechanisms and management of retinopathy of prematurity. N Engl J Med. 367, 2515-2526 (2012). Sapieha, P., et al. Retinopathy of prematurity: understanding ischemic retinal vasculopathies at an extreme of life. J Clin Invest. 120, 3022-3032 (2010). Chen, J., Smith, L. Retinopathy of prematurity. Angiogenesis. 10, 133-140 (2007). Cheung, N. Diabetic retinopathy and systemic vascular complications. Progress in Retinal and Eye Research. 27, 161-176 (2008). Smith, L. E. Through the eyes of a child: understanding retinopathy through ROP the Friedenwald lecture. Invest Ophthalmol Vis Sci. 49, 5177-5182 (2008). Caballero, S., et al. Ischemic vascular damage can be repaired by healthy, but not diabetic, endothelial progenitor cells. Diabetes. 56, 960-967 (2007). Wang, H., et al. VEGF-mediated STAT3 activation inhibits retinal vascularization by down-regulating local erythropoietin expression. Am J Pathol. 180, 1243-1253 (2012). Ritter, M. R., et al. Myeloid progenitors differentiate into microglia and promote vascular repair in a model of ischemic retinopathy. J Clin Invest. 116, 3266-3276 (2006). Saito, Y., Geisen, P., Uppal, A., Hartnett, M. E. Inhibition of NAD(P)H oxidase reduces apoptosis and avascular retina in an animal model of retinopathy of prematurity. Mol Vis. 13, 840-853 (2007). Connor, K. M., et al. Increased dietary intake of omega-3-polyunsaturated fatty acids reduces pathological retinal angiogenesis. Nat Med. 13, 868-873 (2007). Banin, E., et al. T2-TrpRS inhibits preretinal neovascularization and enhances physiological vascular regrowth in OIR as assessed by a new method of quantification. Invest Ophthalmol Vis Sci. 47, 2125-2134 (2006). Dorrell, M. I., et al. Maintaining retinal astrocytes normalizes revascularization and prevents vascular pathology associated with oxygen-induced retinopathy. Glia. 58, 43-54 (2010). Joyal, J. -S., et al. Ischemic neurons prevent vascular regeneration of neural tissue by secreting semaphorin 3A. Blood. 117, 6024-6035 (2011). Binet, F., et al. Neuronal ER Stress Impedes Myeloid-Cell-Induced Vascular Regeneration through IRE1alpha Degradation of Netrin-1. Cell Metab. 17, 353-371 (2013). Fukushima, Y., et al. Sema3E-PlexinD1 signaling selectively suppresses disoriented angiogenesis in ischemic retinopathy in mice. J Clin Invest. 121, 1974-1985 (2011). Smith, L. E., et al. Oxygen-induced retinopathy in the mouse. Invest Ophthalmol Vis Sci. 35, 101-111 (1994). Lange, C., et al. Kinetics of retinal vaso-obliteration and neovascularisation in the oxygen-induced retinopathy (OIR) mouse model. Graefes Arch Clin Exp Ophthalmol. 247, 1205-1211 (2009). Connor, K. M., et al. 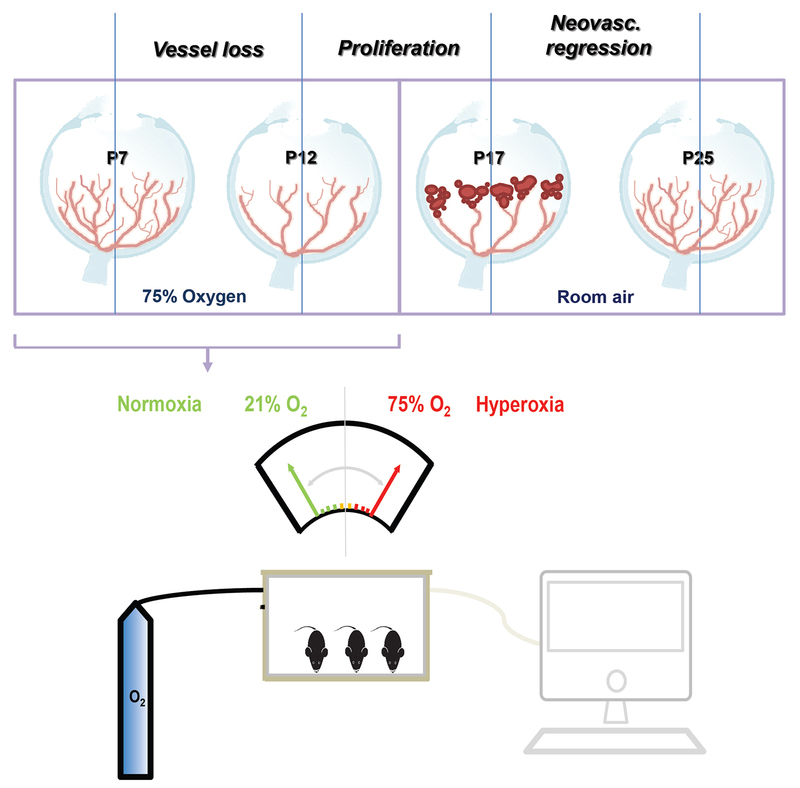 Quantification of oxygen-induced retinopathy in the mouse: a model of vessel loss, vessel regrowth and pathological angiogenesis. Nature Protocols. 4, 1565-1573 (2009). Stahl, A., et al. The mouse retina as an angiogenesis model. Invest Ophthalmol Vis Sci. 51, 2813-2826 (2010). Stahl, A., et al. Computer-aided quantification of retinal neovascularization. Angiogenesis. 12, 297-301 (2009). Stahl, A., et al. Postnatal Weight Gain Modifies Severity and Functional Outcome of Oxygen-Induced Proliferative Retinopathy. Am J Pathol. 177, 2715-2723 (2010). Cerani, A., et al. Neuron-Derived Semaphorin 3A is an Early Inducer of Vascular Permeability in Diabetic Retinopathy via Neuropilin-1. Cell Metabolism. 18, 505-518 (2013). Sapieha, P. Eyeing central neurons in vascular growth and reparative angiogenesis. Blood. 120, 2182-2194 (2012). Dorfman, A., Dembinska, O., Chemtob, S., Lachapelle, P. Early manifestations of postnatal hyperoxia on the retinal structure and function of the neonatal rat. Invest Ophthalmol Vis Sci. 49, 458-466 (2008). Dorfman, A. L., Joly, S., Hardy, P., Chemtob, S., Lachapelle, P. The effect of oxygen and light on the structure and function of the neonatal rat retina. Doc Ophthalmol. 118, 37-54 (2009). Chopp, M., Zhang, Z. G., Jiang, Q. Neurogenesis, angiogenesis, and MRI indices of functional recovery from stroke. Stroke. 38, 827-831 (2007). Li, L., et al. Angiogenesis and improved cerebral blood flow in the ischemic boundary area detected by MRI after administration of sildenafil to rats with embolic stroke. Brain Res. 1132, 185-192 (2007). Robinson, R., Barathi, V. A., Chaurasia, S. S., Wong, T. Y., Kern, T. S. Update on animal models of diabetic retinopathy: from molecular approaches to mice and higher mammals. Dis Model Mech. 5, 444-456 (2012). Chia, R., Achilli, F., Festing, M. F., Fisher, E. M. The origins and uses of mouse outbred stocks. Nat Genet. 37, 1181-1186 (2005). Jenuth, J. P., Peterson, A. C., Shoubridge, E. A. Tissue-specific selection for different mtDNA genotypes in heteroplasmic mice. Nat Genet. 16, 93-95 (1997). Mattapallil, M. J., et al. The Rd8 mutation of the Crb1 gene is present in vendor lines of C57BL/6N mice and embryonic stem cells, and confounds ocular induced mutant phenotypes. Investigative ophthalmolog., & visual science. 53, 2921-2927 (2012).